We often hear of the crisis in education and identify the usual suspects: uncaring parents, a mercenary and indifferent state, commercial-minded private institutions, powerful industrial empire that try to save their souls by the creation of educational wings proudly sporting their names and lineages, teacher- politicians and their patrons, grant giving bodies that do not discharge their responsibility adequately; and when they do, do not ask of the recipients enough accountability. We seldom hear of the real crisis, the crisis at the heart of all education, namely the crisis in teaching and the battle in the classroom. Many of us think that the crisis in education will go away if we were to take timely measures. After all, we celebrate the Teacher's Day; colleges and universities boast the UGC scales; we do have Academic staff colleges; the number of national institutions devoted to research, policy planning and accreditation in higher education are increasing day by day. And yet, we keep hearing of the crisis in education every now and then. The crisis in teaching in contemporary India is compounded by various factors; such factors however are not integral to the crisis I have in mind. The researcher who disdains classroom teaching as an avoidable distraction and merrily flies around the national and international seminar circuit, the pedogogist who refuses to read or study anything new in the field and follows the slogan: 'old is gold', the teacher who thinks that educational innovation and syllabi reforms, indeed lesson planning and course completions, are plainly unnecessary to his/her creative genius are equally part of the problem, but they are not endemic to the problem. We must fathom greater depths in order to find the real causes when we think of the many ways we can be a good teacher in the next millennia. Certainly, mastery of the newer approaches, ICT driven educational technologies, the use of digital media and so on can help. They are necessary but not sufficient conditions for effective dissemination of knowledge in the classroom context. The real crisis of teaching is the crisis in the classroom. The crisis may be dramatized by the choice between two models essentially; the Socratic model [Socrates taught: 'know thy self'] and the model of Macaulay. [Macaulay, the English educationist had famously decried native languages and education in colonial India and advocated English education instead; sadly we are, for the most, part following his footsteps]. Whatever else we may have done, none of the educational planning from the 'Wood's Despatch', to Macaulay's Minutes, the major educational commission chaired by luminaries like Dr. S. Radhakrishnan and Dr. D.S.Kothari have done enough regarding the ongoing debate. Socrates remains a symbol a lip service and a dream and a mantra. Ivan Illich's goal of deschooling society, only an ideal. Sri Aurobindo's important proposition in the essay 'A system of National Education' in the first decade of the 20th century that the first principle of all true learning is that nothing can be taught, the teacher is not an instructor; he is a friend and a guide remains an elusive and utopian aim, the Mother's radical view of 'No school' in the Auroville experiment as far too idealistic, disconnected from the real world. Best teaching it seems to me cannot take place in the absence of a radical revision of pedagogy and the art of teaching in the classroom. The time haloed lecture method, sanctified by Thomas Gradgrind of Charles Dicken's Hard Times must give way to the teacher as a fellow enquirer and not a repository of knowledge and wisdom. Verbal narcissism of the teacher before a captive audience, the learning with a notebook or an I Pad and the teacher at the podium must be replaced by real dialogues in the class room where problems and issues are articulated, discussed and debated in a respectful but egalitarian manner with the teacher as a facilitator. Thanks to the decline in reading habits and the ever present google and Wikipedia, even the lecture method has lost much of its sheen. The Socratic Method must begin early, right from the elementary level with the curiosity of the child kindled. Knowledge must not be regimented by disciplinary boundaries. The teacher must discover himself or herself as a Renaissance personality who treats all provinces of learning as his or her own ethically endowed and intellectually empowered, such a teacher is an example both in words and deeds. Collegiality is a creed and a necessity both to the colleagues in the field and to the learners that are under his/ her charge. When examples are set, evil like plagiarism will be a thing of the past. The real crisis is indeed the crisis in the classroom. The next decades will witness the crisis in sharper focus. We must change our pedagogy quickly. By restoring Socrates to the class room, we can aspire to be an effective teacher. We need to look within and put the house in order even as we ask for institutional changes and meaningful interventions from outside. Unless we can come up with this new teaching protocol in the classroom, all reforms will remain a chimera. 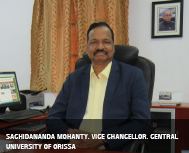 Former Head - Department of English at the University of Hyderabad, Sachidananda Mohanty is the Vice Chancellor of the Central University of Orissa at Koraput.